Scoliosis refers to the lateral curvature of the spine with the rotation of the vertebrae around the vertical axis. Scoliosis develops during the growth spurts in children, usually not before they reach school age. It affects about 4% of girls and 3% of boys. In most cases (approx. 90%), it is not possible to ascertain any cause: this is so-called idiopathic scoliosis. The sooner scoliosis is diagnosed, the better and gentler the means of treatment. 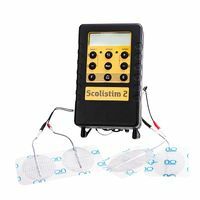 With two stimulation channels and programs specifically designed for the noninvasive treatment of scoliosis the Scolistom 2 offers a comfortable method to strengthen the muscles of the back. The treatment happens at night while the user is sleeping leading to a high acceptance of this intervention.